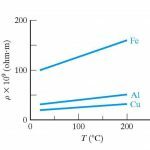 Home / Electronics Articles / What is the effect of temperature on semiconductor parameters? 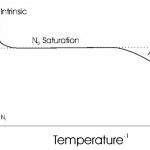 What is the effect of temperature on semiconductor parameters? The most commonly used semiconductor parameters are intrinsic concentration, forbidden energy gap, mobility and conductivity. The effect of temperature on these parameters is discussed below. Intrinsic concentration (ni) : The number of holes or electrons present in an intrinsic semiconductor at any temperature is called intrinsic carrier concentration (ni). It depends upon temperature of an intrinsic semiconductor. In N type semiconductor, the number of free electrons (n) does not change appreciably with the increase in temperature, but number of holes (p) increases. In P type semiconductor, the number of free electrons (n) increases with the increase in temperature, but number of holes remains constant. Forbidden energy gap (EG) : The energy required to break a covalent bond in a semiconductor is known as energy gap. It is equal to the difference of energy levels between the conduction band and valence band of the semiconductor crystal structure. The forbidden energy gap decreases with the increase in temperature. Mobility (µ) : The mobility means the movement of charge carriers. The mobility of intrinsic semiconductor decreases with increase in temperature because at higher temperature, the numbers of carriers are more and they are energetic also. This causes an increased number of collisions of charge carriers with the atoms and thus the mobility decreases. Conductivity (σ) : The conductivity of an intrinsic semiconductor depends upon the number of hole electron pairs and mobility. The number of hole electron pairs increases with increase in temperature, while its mobility decreases. However, the increase in hole electron pairs is greater than the decrease in their mobility’s. Therefore, the conductivity of an intrinsic semiconductor increases with increase in temperature.The conductivity of an extrinsic semiconductors decreases with the increase in temperature, the number of majority carriers is nearly constant, but mobility decreases. Thus causes the conductivity to decrease. What are the properties of semiconductor?